Condo de luxe dans la Colina Del Sol de La Paz. Perché surplombant la baie et la ville de La Paz ce condo offre une incroyable vue sur le coucher du soleil. TRANSPORT GRATUIT PRIVE arrivée et au départ. À proximité de la mer et du centre ville ce tout nouveau condo entièrement meublé est la meilleure opportunité pour votre location de vacances en ville. Parking couvert et 24 heures de sécurité. Cuisine complète, Chambre des maîtres avec un téléviseur (lit King size) avec une grande terrasse, 1,5 salle de bain avec hydro massage baignoire, salle de séjour avec une grande et très confortable lit queen convertible, accès à la terrasse. Télévision par satellite. L'établissement inclut tout ce que vous attendez: lave-vaisselle, d'autres articles de cuisine nécessaires, mixeur, grille-pain, cafetière, draps frais, un sèche-cheveux, serviettes de bain et tapis de bain, serviettes de plage, articles en plastique complet pour prendre les repas à la piscine, lave-linge et sèche-linge, etc. Fondamentalement, juste apporter votre maillot de bain et quelques t-shirts. À proximité de la piscine et le jacuzzi, il est grand barbecue partagé. Un club de fitness inclus privé est disponible. La Paz est la capitale de Baja California Sur, une belle ville mexicaine avec juste la touche du tourisme. A proximité vous pouvez excursion d'une journée à Todos Santos art colonie ou hors de Los Cabos. club de remise en forme partagée, Jacuzzi. 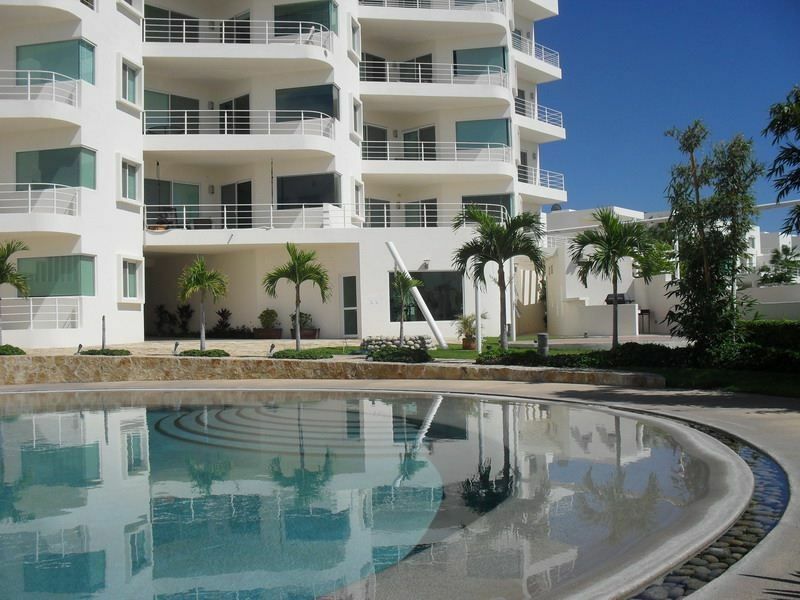 Clean, nice views, pool, parking, quick access to old town La Paz/malecón. see review - didn't stay here! please stop sending me review requests. I cancelled my stay the night before I was scheduled to arrive! Loved this condo! Perfect for our needs. Really enjoyed our stay at this condo. Arthur was waiting with the keys when we arrived and was very helpful in showing us around. The unit was very clean, bed was comfy and kitchen well equipped. The only reason I didn't give it 5 stars was because I felt a few more towels would have been nice. We were provided with one bath sheet each in the ensuite and had a bath towel in the half bath. Really would have been nice to have a face cloth and maybe a couple of hand towels. Also, there was no bath mat which made getting out of the shower tricky since you were stepping onto a tile floor - very slippery with wet feet. I will definitely be looking at renting this unit again however, on our next visit to La Paz. Great location, great pool some improvement is needed. My wife & I stayed here in La Paz for a week. Rent a car this condo is too far away for walking. The good: beautiful floors, nice appliances for the most part, air conditioning worked great, pool is great, with nice pool chairs, the deck is nice with a great view of the city. Nice to have washer & dryer in the unit. The security is wonderful and parking is nice. The grounds are very clean and cleaned up almost every day. Manuel is nice and met us at a local restaurant and we followed him to the unit. The town is awesome with your typical terrible streets and poverty but when you are close to the boardwalk the place is pretty nice. Food prices here are very affordable. I'd say food at restaurants are about 1/3 cheaper than what you would find in the States. People are very nice and friendly. I never felt like I was in danger at all, we walked the Malecon (boardwalk) at night with no problems. The police are very present but friendly. This is a nice alternative to Cabo, no tourist traps, no pressure to buy stuff, no kids used to hawk you junk. The kids here are in school. Improvements: Ice maker doesn't work, the disposal doesn't work, the bathtub jacuzzi has a filter on it that is nasty dirty, never tried the jacuzzi because of it. The small coffee maker is falling apart and is cheap, needs to be tossed and new one purchased. There is no TV in the main living room so you have to use the TV in the bedroom. All channels are in spanish so I bought an HDMI cord to hook up my laptop to the TV so we could watch Netflicks. I'm pretty good at messing with TVs so if you can't do that - you are not going to be able to watch english speaking TV. They only provide two towels, more should be available to guests. The bed was very hard and my wife said her back ached after staying here. The owner seemed very proud that it was "firm" but it might need to be updated a bit. It needs a fresh painting and when we got there the kitchen was dirty and Manuel was not happy with the maid. The streets are rough they have signs on buildings to show you if the streets are one way or not. Stop signs are called "Alto" and Mexicans don't stop, they treat them like "yield" signs. If you go grocery shopping, be patient and have full use of your cell phone!! I mean make sure you have roaming on your phone, we used it to find Wal-mart and beaches. We also used it to translate spanish. Overall great place especially for the price. Good location for La Paz, especially with a car. Host was very nice, stopped at a store for os when we arrived and met downtown. The hot tub didn’t heat up, a bit disappointing. The place needs a good cleaning, especially the floors.